Deprived of his home and knocked out of the sky by the Mandarin's men, Tony must repair his latest Iron Man armor in secret, hiding in a rural area where the right tools (and the right clothes) are hard to find. 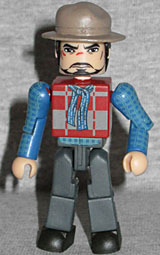 Calling this figure "Cowboy Disguise" Tony Stark is misleading: he wasn't disguised as a cowboy, he just happened to be wearing a cowboy hat he lifted from someone. And this Minimate doesn't do a very good job of looking like a cowboy hat anyway. It's like they predicted Pharrel's Grammy hat debacle a year ahead of time. 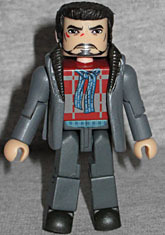 We're sorry, but whoever translated this hat to Minimate form did a bad job. Fortunately, you can discard the hat if you like: Tony's got hair to replace it. He's wearing a blue flannel shirt, a red vest and a blue scarf (all painted on, not extra pieces), but you can also take his arms off and give him a big grey coat to wear over it all. The only problem with that is that in the scene where he was wearing the coat - ie, walking around Rose Hill (a real town, just in North Carolina rather than Tennessee) - he didn't have a bare head, he was wearing a hunting cap. Two hats and no hair probably would have been weird for this toy, though. They did a great job painting his clothes, and the distinctive wounds on his face. The founder of Advanced Idea Mechanics, a scientific thinktank, Killian hired Maya Hansen to pursue her research into biological enhancement. But Hansen didn't realize that Killian's plans for her work were far from benevolent. 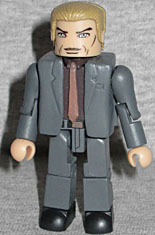 It's nice to have plain figures of guys in suits (they make good "victim" fodder for villains to threaten), but this figure really missed an opportunity. Aldrich Killian definitely wore this outfit (it's his "macking on Pepper" get-up), but wouldn't it have been better to get his white suit, maybe with a removable jacket/extra arms so we could make him bare-chested? You know, the exciting parts of the movie? It's possible AA didn't get to see that when they were developing the line, but it still would have made for a better toy. At least it's not a living spoiler, the way the Legos were. Speaking of missed opportunities, the movie kind of dropped the ball on AIM, too. We're not asking for an army of beekeepers, but would it have been too much to ask to show us a couple guys in yellow hazmat suits? That's all we needed, just a little nod somewhere.